For much of the country, this has been the winter of “too much snow”. It may be hard to believe but spring is only about a month away. It’s true. You’ll be getting that lawn sprinkler system out of hibernation in no time. Spring is also a good time to take a look around your yard and lawn to determine if there are any imperfections that need to be fixed. Like bald spots. We are not talking about the type of bald spot that you hide with a comb-over or a bad toupee. We’re talking about bald spots on the lawn. Fear not, there are things you can do to get your lawn looking fuller and richer. Experts say the first thing to do is try and determine the cause of the bald spot. Fungi, bugs and grubs can all cause bald spots. If none of these is the culprit, some fresh grass seed might do the trick. That’s good news with spring on the horizon. Once the ground temperature gets around 52 degrees, seeds will grow. Remember, those seeds will need water. That’s where that lawn sprinkler system will come in handy. Once you've identified your bald spot (the one on the lawn) and you've got your seed, you’re ready to start digging. 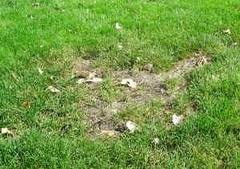 Use a shovel or sharp spade to cut the area around the dead turf. Use the flat part of the spade to lift off the dead turf. Fill the area with fresh, clean topsoil to keep it level with the rest of the yard. Rake the area to remove clumps and make sure everything is smooth. Now can apply a thin layer of seeds to the area. Gently rake the seeds into the topsoil. Make sure to water those seeds early in the morning and early in the evening. This should all help eliminate those unsightly bald spots.